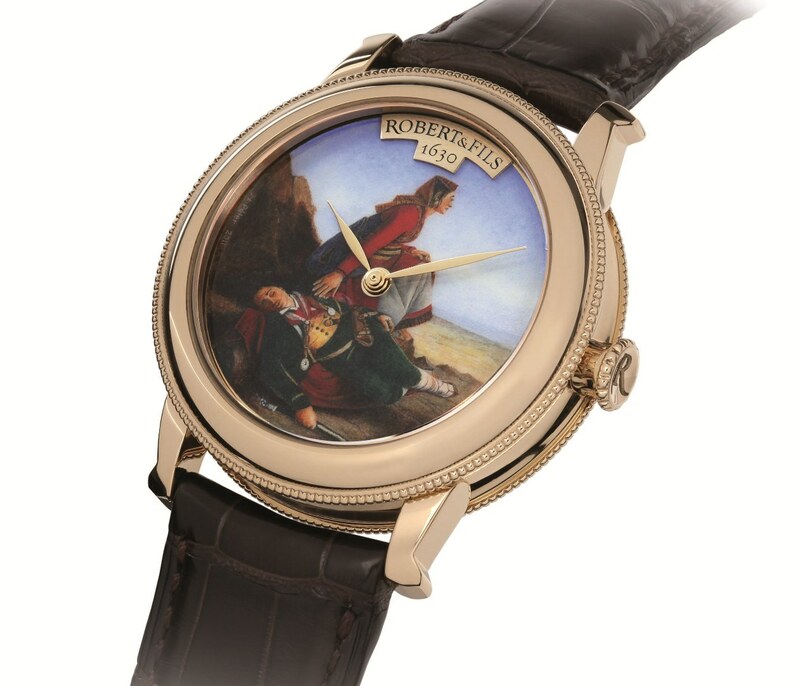 The Swiss watch industry continues to experiment with ever more high tech materials and employs rare precious metals with which to create horological masterpieces, but for Gilles Robert, founder of Robert & Fils 1630, nothing can replace the tradition and artistic skills that distinguishes Swiss timekeeping around the world. Robert & Fils 1630 watches emphasize traditional artisanal skills which today only a very few master Swiss watchmakers are still practising. Mastered by only a handful of artisans in the world, grand feu enamelling is impressive because it is so complex. 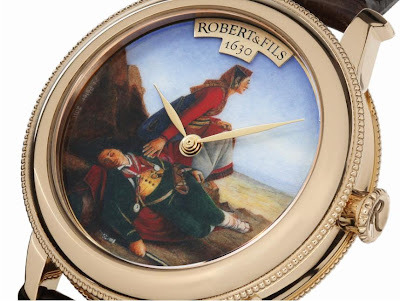 'The Brigand's Rest', taken from a painting by Swiss master Léopold Robert, is the fourth in a series of exceptionally fine Robert & Fils 1630 watches to feature these fast disappearing skills. It’s worth giving the full story of feu enamelling straight from the manufacture because it is fascinating, involved and increasingly rare. The enamelling is carried out using a very fine brush dipped in coloured enamel paste that the artist applies point by point onto a support. The colours of a figure are applied with great precision starting with the contours. The main difficulty in this art form is the firing of the enamel, which is conducted in an 800C oven after each stage of the process. Each enamelled piece may require more than 30 firing cycles. This is certainly an ordeal by fire for this totally unpredictable and capricious material, where the colours of the enamel change during the firings. The artisan has no room for error, as any mistakes might cause irreversible damage to the enamel requiring the process to be started all over again. In addition to the firings, the art of enamelling involves sanding, a technique that demands great care to avoid ruining the result. At the final application of the enamel, the artisan applies a translucent flux over the image before placing the piece in the oven at a temperature of 900 C.
Once glazed, the enamel’s perfectly fixed colours will travel through time without ever changing. An integral part of haute horology, the grand feu enamelling process provides each Robert & Fils 1630 timekeeper with important added value that will only increase as the years go by. At Robert & Fils 1630, the extreme care provided to each timekeeper’s finishing is not only a simple matter of beauty. It is also a guarantee of the great attention that the Robert & Fils 1630 artisans pay to each piece before it leaves the ateliers. Engraving is a skill intimately tied to fine watchmaking. Mixing traditional skills with modern technology, enamelling requires infinite patience combined with unfaltering precision so that even the tiniest details can be showcased. 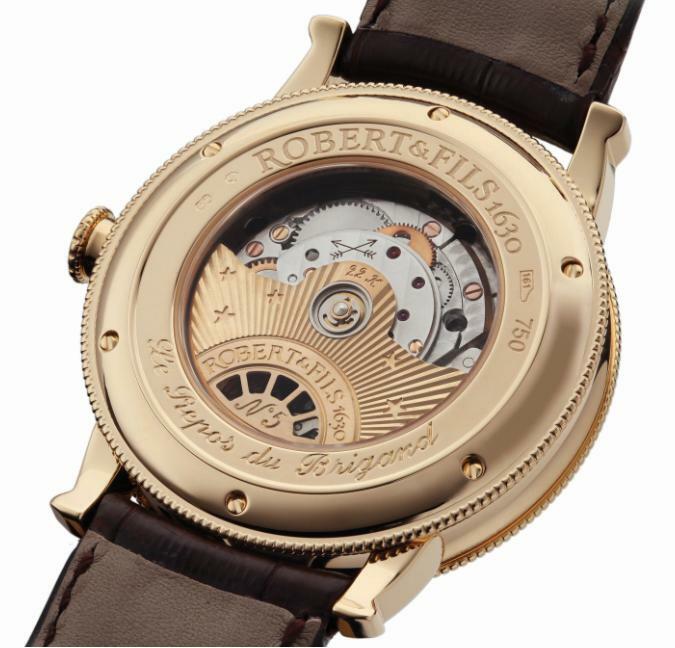 Each Robert & Fils 1630 movement is meticulously hand-engraved with uncompromising attention to detail. Line engraving, set engraving, lacquered engraving - these are among the many techniques used to carve delicate motifs that the master engraver can achieve by skilfully using all sizes of burins. The difficulty in working with engraving is getting the depth of the line correct in order to give life to the motif and reproduce the tiny details on the watch cases. Each engraving, the becomes exclusive and creates a one of a kind timepiece. Case and dial in gold, grand feu enamel, inspired by “Brigand’s wife watching over the rest of her husband”, on display at the Museum of Fine Arts in La Chaux-de-Fonds (Léopold Robert, oil on canvas, Rome 1827). Deposit from Fondation Gottfried Keller, 1964. “Five step” historic automatic movement, produced at the Fontainemelon manufacture between 1960 and 1970. Oscillating weight in 22K gold. As for price, there's not much change left from $100k, – US$95,123. The piece was originally displayed at Baselworld earlier this year.